Interests:Researching/remembering my late grandfather, Thomas William Hall MM who served with the 56th (London)Division throughout WW1 and, in the regular Army through WW2 until his retirement and my Great Aunt, Ethel Groom who was a Staff Nurse with the QAIMNS(R)and nursed in France and Italy. Awarded Croix de Guerre (avec Palme) – Gazetted Issue 300431 – 1 May 1917 Supplement p 4159 for an actions on night of 1/2nd October 1916 somewhere near Morval. I have a photo of an un-named young soldier with a note written by my GF on the back indicating that he was involved in rescuing him, but that he died of wounds some days later. ‘Dear Sgt Hall, On behalf of the officers and men of the late 6th County of London Battery, I beg you to accept this small token of gratitude and admiration in the way you came to our help on that fateful night of Oct 1st 1916. The whole Battery was desirous of showing its appreciation of your gallant work and of the way you came to the succour of our stricken comrades and also wished to give you something as a reminder in years to come. The whole Battery joins me in congratulating you on having the Croix de Guerre bestowed upon you, never was it better deserved by anyone and we are all very pleased about it. Please accept this little present with our warmest thanks and as a tribute from those you succoured in their hour of need. I have tried, so far unsuccessfully, to find any information about the actions which resulted in these two awards. The War Diaries mention the awards when they were announced, but don’t have any specific details. If you are able to shed any light, I would be very grateful. I also attach a copy of a photo of my GF’s Battery – My GF is seated 5th from the left, 2 rows from the front (not wearing a bandolier.) On the back he has written ‘Out of the Line for a rest. B Battery 281 Bde RFA 1917.’ I’m not sure whether men were moved between Batteries, since other papers show that he was with A Battery. Having compressed it for the Web, the faces are unclear, but I'd be happy to send you a higher res. image, if it is of interest. Can you provide any extra information about 27 Siege Bty and the gas attack on 8 April 1917. Gnr W Barnes, 144961, was gassed that day and after evacuation to Norwich War Hospital he died on 17 April. His body was returned home to Malmesbury, Wilts where he is buried. Do you have anything on the 21st Anti-Aircraft Section, RGA? I am particularly interested in Captain, Officer Commanding, Noel Charles Spicer Simson, or Spicer-Simson, who died 26 September 1915.
helpjpl: I am sorry but I do not have anything on 21st AA Section RGA or Captain Simson other than that there is a photo of him in War Illustrated. ChasMalmesbury wrote: "Can you provide any extra information about 27 Siege Bty and the gas attack on 8 April 1917. Gnr W Barnes, 144961, was gassed that day and after evacuation to Norwich War Hospital he died on 17 April." The war diary for 27th Siege Battery, RGA for 8 April 1917 states: "Mardevill. Position same. Number of rounds fired: Nil. Casualties: Nil. I Officer and 36 other ranks proceeded to Aux-Rietz to dig gun emplacements for forward positions." There is no mention of Gnr Barnes or a gas attack during the month of April 1917. The only casualties mentioned for the month of April 1917 are for 17 April 1917: Gnr Barnacle and Bowles killed in action and Gnr Reilly and Wavell wounded by hostile shell fire. I have a copy of 27th Siege Battery, Royal Garrison Artillery, BEF, France & Flanders and the only casualties listed under killed in action for April 1917 are the above-mentioned Gnr. Barnacle and Bowles and the only wounded listed for the month of April 1917 are Gnr Reilly and Wavell. I'd be very grateful for the photo from War Illustrated. Have a look at a year later. He died 17th April 1918. Please could you have a look at 250th Siege Battery history for 11/12/1917 - am interested in Gunner 165544 Wignall who was killed that day. helpjpl: Unfortunately I do not have the photo from War Illustrated. Just a note that there is one. Charles: 144961 Gnr. W. Barnes is listed in 27th Siege Battery, Royal Garrison Artillery, BEF, France & Flanders as being wounded on 8 April 1918 along with 35 other ranks, but his death is not listed, probably because he had left the battery by that time. Unfortunately the battery war diary only covers up to February 1918. The battery was serving under 7th Brigade, RGA in April 1918 and that unit's war diary for 8 April 1918 states: "Thick mist all day. Close to no wind. No visibility. During the early morning commencing at 3:30am the enemy again put down a very heavy gas bombardment. This lasted until 7am." No details about casualties are given. Nick wrote: "Please could you have a look at 250th Siege Battery history for 11/12/1917 - am interested in Gunner 165544 Wignall who was killed that day." djdf1 wrote: "hi i would be extreemly grateful for any info you could find on my grandfathers unit 82nd seige battery from 1916 to end of the war he served right through from oct 14 to feb 1919 regards dave denoven he was gunner joseph denoven 46805 rga"
djdf1: The war diary of 82nd Siege Battery RGA from April 1916 to February 1918 is available from The National Archives under WO 95/323. It is 95 pages in length. Currently the diary is being digitized by TNA. 1. I do not have a copy of the war diary for 281st Brigade, RFA for the period 1 Aug 1915 to 31 May 1010 but it can be downloaded online on The National Archives website as WO 05/2940/3 (281 images) for £3.30. 2. It is difficult to find why Military Medals and French Croix de Guerre were awarded but there might be some information in the war diary. 3. The letter to Sgt Hall from Capt. G M Hamilton is interesting to me as I am the custodian of his Great War Victory Medal. 4. I would love to have a high resolution scan of the photo of B/281 and will send you a PM with me email address. Sorry that I could not be more useful. Thanks ever so much, that's greatly appreciated. Hi, could you please find out anything about 'C' Battery, 75th Brigade Royal Field Artillery, specifically for a Lieutenant John Llewelyn Edwards. I'd like to find out possibly how he died and what his Brigade was doing that caused his death. He died on 7th September 1917 during the Battle of Pilkem, and he is buried in Canada Farm Cemetery. ANY information about this man would be very, very much appreciated. Thanks, Tom. Interests:Researching my Great Grandfather and his brothers. I am new to the forum - hopefully I'm posting in the right place? I am trying to find out some further information about my great grandfather's (and his brother's) service during the war. I have found records in the medal index relating to Leonard and John. These add an "L/" prefix before Leonard's and Charles' regiment numbers. They also state Leonard was a Driver. I believe they were both awarded the Victory and or British medals. Can anyone tell me more about which exact regiment Leonard and Charles belonged to? Is the L/ prefix significant? Were they likely to have fought together? Is there a way to find out which battles they fought in? I cannot find a medal index record for John Edward Leaver with a reg. number that matches the reg. number in the absent voters list. I can find John Edward Leaver as follows, "1660. Pte. 8th R.W Surr. R" and an index card which also mentions Queen's (as per absent voters) R York and Lancaster with the same 1660 number and two other reg. numbers (52728 and 4736661) but not the number that appears on the absent voters list? Is this is the same person? I have a photo of my gggf in uniform with two men and I am guessing they are his brothers Charles and John. I would also like to work out from the photo which is Charles and which is John. Is this possible from looking at the uniforms they are wearing? Any advice much very appreciated. mrtom654321 wrote: "Hi, could you please find out anything about 'C' Battery, 75th Brigade Royal Field Artillery, specifically for a Lieutenant John Llewelyn Edwards." The notebook of Major Edward H. Giffard dated 8 September 1917 who was serving with 75th Brigade, RFA at the time indicates: "Quiet night, but heard that Waggon Lines had been bombed; Edwards (Lieut. J. L. Edwards) and Jenkins (2/Lieut. G. P. Jenkings) killed and we had four men killed and eight wounded: shocking bad luck." Sources: University of Wales Roll of Service, 1914-18; Guns, Kites and Horses: Three Diaries from the Western Front; various Army Lists. You might want to obtain a copy of Giffard, Sydney (Editor). Guns, Kites, and Horses: Three War Diaries from the Western Front. London: The Radcliffe Press, 2003. One of the diaries is that of Major E. L. Giffard who served with 75th Brigade from November 1916 until dying of wounds on 10 November 1918. Hi. I am researching for my regiment (104 RA) as many members of 67 Brigade RFA (WW1) I can to add information to the IWM lives. All current batteries of the RA have been tasked to do this by the Master Gunner to research their respective unit lineage, so if you do have some information or pictures of 67 Brigade troops this would aid me greatly. 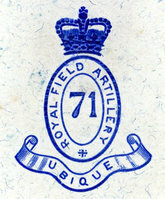 I have identified about 70 members of 67 Brigade so far and I am particularly interested in 'A' Battery, as it is the descendant of my battery (211 South Wales Battery). On another note, my great uncle was a gunner in the 1st Monmouthshire Vol's RFA from 1913 to 1915, so if you have any information on this unit around this time I would would also be grateful. Oh, and I have also found out that his, and his fathers employer at the time of WW1 was Major-General William Frederick Cleeve CB commandant of the Royal Military Academy, Woolwich, at his home near Caerleon, South Wales. Have not been able to find a picture of him. The L/prefix for the Royal Field Artillery indicates that the soldier enlisted in a 'local' artillery brigade (up to that time the RA recruited throughout the UK but in 1915 it enlisted men in 'local' brigades - those RFA brigades numbered between approximately 140 to 180 Brigade, RFA). As the men in most of those brigades were not numbered sequentially it is difficult to tell with which of these brigades he might have served. I am not that conversant with the regimental numbers for The Queen's but a six digit number may indicate a Territorial - if he joined prior to late 1916 he would also have had a number with less than six digits. As Charles was in the Royal Field Artillery and John in The Queen's it would be possible to tell them apart by looking at their cap badges or there collar insignia. Like all War Diaries the only persons mentioned by name are Officers. Please find the attached document which will be of use to you. Sergeant William Henry Ball 25405 "C" Bty, 75th Bde. He was mentioned in dispatches in 18/5/1917 but not sure what for. Also his brother Sergeant John Buckley Ball 13728 "C" Bty, 75th Bde. Who died on 4/09/1917, and buried at Canada Farm Cemetery. area of Canada Farm prior to his death? deployed and do you have information on the brigades actions? Any help in these questions will be really appreciated. I have a photo which I thought *might* be of C/75 in 1916 or 1917 so would be really interested in seeing any known image of men in it .. if you could post part of it ..? ?